The water level in Louisiana’s Toledo Bend Reservoir has been very low, and it could get a lot lower. The time to do something about the latter is very short. This Friday, Jan. 6, is the last day for the public to comment about a proposal to sell tens of millions of gallons of water a year from Louisiana’s share of the reservoir to a private partnership, which then would sell the water to Texas. If approved, the deal between the private Toledo Bend Partners LP of Texas and the public Sabine River Authority of Louisiana would last for 50 years and could be extended for another 49. It could be a money-maker for Louisiana, which is preparing to shut down its electricity generators on Toledo Bend, which is in Sabine and DeSoto parishes, in favor of making more lucrative deals on the sale of fresh water. Louisiana has plentiful fresh water, but that supply is not endless. The proposal has some people more than concerned as it heads for a Jan. 26 vote by the Sabine River Authority. Those on the Toledo Bend Citizens Advisory Council and others who know the history, geology and appeal of the region in west-central Louisiana also know that a much-reduced reservoir will adversely affect the region’s economy, property values and overall viability. While not opposed to the sale of water, opponents of this deal say they want the state to make agreements that will protect the integrity of this resource. This deal, they say, does not do that. Meanwhile, fast-growing Texas is working on multiple fronts to acquire new sources of fresh water. That’s in addition to what it already is entitled to draw from Toledo Bend, a joint project of Texas and Louisiana. Before any agreement is signed, this deserves thoughtful scrutiny and, by Friday, plenty of citizen input. 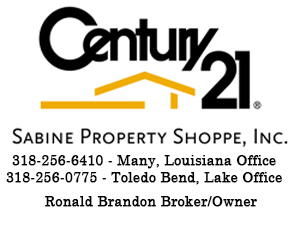 —Background, contract and contact information: Go to www.toledo-bend.com. —To comment: Comments may be emailed to Becky.Anderson@la.gov or mailed or delivered to Jim Pratt, Executive Director, Sabine River Authority, 15091 Texas Highway, Many, LA 71449. —Public meeting: The Sabine River Authority of Louisiana will hold a public meeting at 6 p.m. Jan. 12 to discuss the proposed agreement. 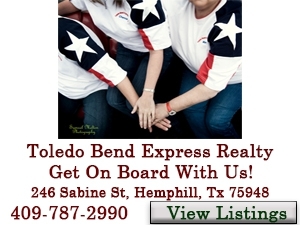 The meeting will be at Cypress Bend Resort, 2000 Cypress Bend Parkway, Many.